Google has today taken the wraps off an updated version of its flagship Nexus 7 tablet, making it thinner, lighter and adding a higher-resolution display. According to Engadget, the 2013 Nexus 7 runs Google’s latest Android OS, Jelly Bean 4.3, and features a 1080p high resolution display, making it the world’s highest resolution 7-inch Android tablet with a 1280 x 1920 pixel display i.e 323 pixels per inch (ppi). This will surely put pressure on Apple to release the next iPad mini with a Retina display. Google claims that the Nexus 7 display can show a 30% wider range of colors than the original and can render true 1080p video. The tablet also features stereo speakers, one located at either end of the device when held in landscape mode. 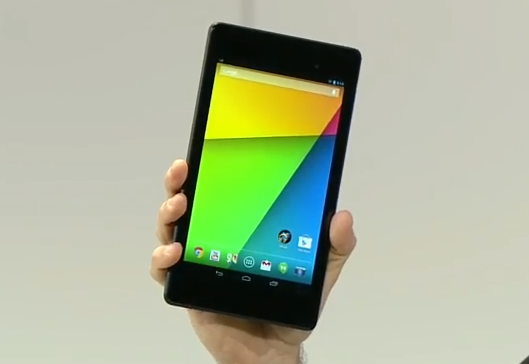 The new Nexus 7 sports a 1.5Ghz Snapdragon S4 pro processor, offering 1.8 times the CPU power and 4X the GPU capabilities of its predecessor, and also includes NFC to share data with other nearby NFC-enabled devices. “There’s also SlimPort support for pushing 1080p content to your TV. The front-facing camera remains just 1.2 megapixels, though, hopefully ASUS has moved to a higher-quality sensor. There’s now a camera around back as well, a rather pedestrian 5MP shooter, but it should be good enough for scanning QR codes, performing image searches and taking the occasional YouTube clip of your cat/child/hedgehog/drunk celebrity. The Nexus 7 starts at $229 for a 16 GB Wi-Fi-only model, while 32 GB Wi-Fi-only model will cost $269, when it goes on sale on July 30th.